Former IN&M chief executive Gavin O'Reilly at last year's AGM. A SINGLE INVESTOR has this lunchtime bought a 5 per cent share in Independent News & Media, at a price almost 25 per cent above what was being charged on the market at that point. A single trade processed at the stroke of noon saw 27.77 million shares – accounting for 5.04 per cent of the entire company – sold for 35 cent each. Shares in the company had opened at 27.5 cent each, and stood at 31.5 cent each at 2pm – an increase of 14.5 per cent on their opening price. The 35c price marks the highest price at which IN&M shares have traded in nine months. No announcements were made to either the Dublin or London stock exchanges, both of which host trading in IN&M. The last major transaction of IN&M shares came on April 19, when an anonymous buyer took 13 million shares (2.4 per cent) of the company. That afternoon, Gavin O’Reilly stepped down as chief executive, being succeeded by the group’s previous Chief Operating Officer, Vincent Crowley. Magnate Denis O’Brien – who is known to owns 22 per cent of the company – has been regularly connected with a potential move to take control of the group. Its AGM, at which further developments are expected, is set for 8 June. 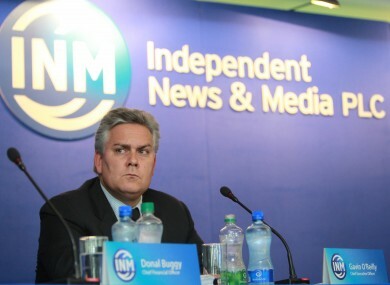 Independent News and Media Plc reported a pre-tax loss of €63.6m last year. Email “Investor buys 5 per cent of Independent News & Media in one single trade”. Feedback on “Investor buys 5 per cent of Independent News & Media in one single trade”.